April 2015 n Performance & Hotrod Business n 51 Malco Products, Inc. | Annandale, Minnesota, U.S.A. | www.malcotools.com | © 2015 SEMA Award Winner! Best New Collision Repair and Refinish Product 2014 QHT1A The Quarter Panel Air Hemming Tool replicates a hammer and dolly motion at high speed to bend and close wheel arc flanges of replacement quarter panels on late model cars 80% faster based on field trials. Also available as a Drill Attachment Model: QHT1. Hem Quarter Panels 80% FASTER! Malco-Performance Hot Rod 7.125x4.875 April 2015.indd 1 2/27/15 11:11 AM every model and model year the company covers. "Part of it is, that's the way they remember the car," Quinnell postulated. "Stock" is also the one-and-only non- arbitrary choice. "It's not like buying a cell phone case, where there are literally thousands to choose from. If you want to buy an upgrade instrument package for, say, a 1957 Chevy, there are maybe five or six available." A customer who isn't partic- ularly love-struck by one of those choices will likely default to original. Fortunately, Quinnell added, it's not unusual to find original 1955 or 1972 gauges still in good working and aesthetic condition, albeit half-hidden under a sig- nificantly deteriorated lens. So "we can sell the customer just a lens set, which will make it look all new again." Replacing bright panels and trim can also deliver a major visual impact for a minimal investment. "Especially on the '55-'57 Bel Airs, they have beautiful trim that spans the width of the dashboard— and just changing that out makes the entire dash look brand new." For all three model years (yes, they are different) CARS offers a three-piece set that reproduces the factory look and retails for under $200. Billet replacements are also available, with or without radio openings. 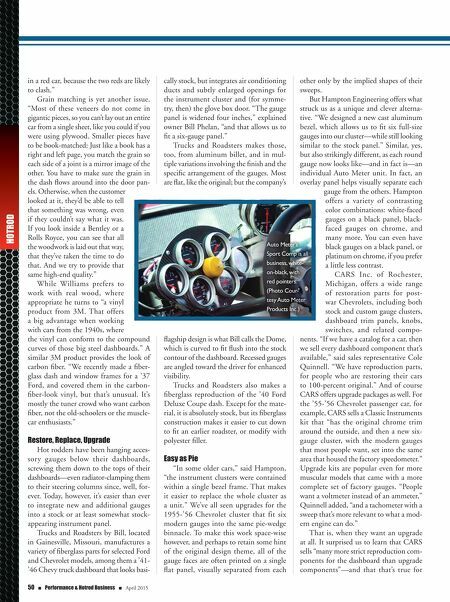 VDO launched several new products at last year's SEMA Show, including "a drop- in dash insert for the '55-'56 Chevrolet," said Ross, "a set of gauges that look right at home in a Porsche 356"; and the com- pact CB500 universal cluster, which fits a speedometer, tachometer, and temperature and fuel gauges into a true plug-and-play module that requires no programming. "It's ideal for builds with limited dash- board space," Ross added. White-number, re-pointed gauges are available with grey or amber faces, and the outer bezel can be polished aluminum billet or simply painted black. Auto Meter's newest products include its line of "Direct Fit replacement gauge panels for popular performance cars and trucks," said Mills. "We have 15 so far, and are continuing to expand the lineup." Also new from Auto Meter is the Plug & Play LS Tach Adapter kit. 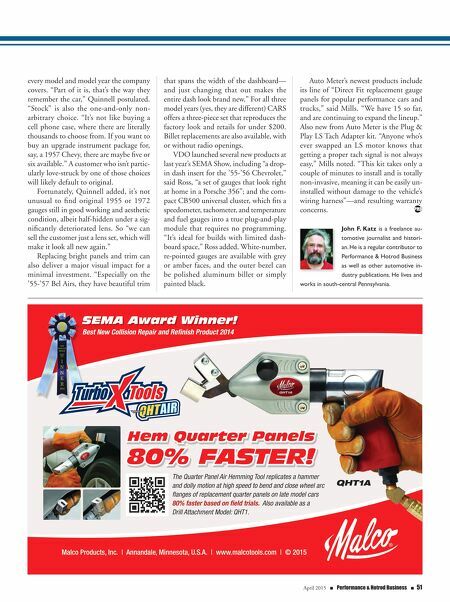 "Anyone who's ever swapped an LS motor knows that getting a proper tach signal is not always easy," Mills noted. "This kit takes only a couple of minutes to install and is totally non-invasive, meaning it can be easily un- installed without damage to the vehicle's wiring harness"—and resulting warranty concerns. John F. Katz is a freelance au- tomotive journalist and histori- an. He is a regular contributor to Performance & Hotrod Business as well as other automotive in- dustry publications. He lives and works in south-central Pennsylvania.